Posh left-back Andrew Hughes crosses the ball into the Charlton penalty area. Photo: Joe Dent/theposh.com. Peterborough United defender Andrew Hughes is looking to put the blow of a defeat to Blackburn behind him as Posh gear up for a “massive” FA Cup replay against Woking. Posh will earn a trip to Championship side Aston Villa if they win the second round replay at the ABAX Stadium on Tuesday (December 12) against non-league Woking. They will hope for a better result in front of their home fans than yesterday’s result (Saturday, December 9) after Charlie Mulgrew and two goals from Bradley Dack early in the second-half earned Blackburn a 3-2 win. Steven Taylor had headed Posh into a 11th minute lead, while Jack Marriott tapped in a late consolation, although Posh played the final few seconds with 10 men after Baldwin received a second yellow card for fouling Dack. Left-back Hughes said: “I think once we conceded we just needed to keep doing what we were doing beforehand. “We’ve shown we are a good team. Blackburn are no mugs, so to go out and play the way we did and take the game to them at times is credit to us. “We’ve got a massive game Tuesday. All the boys are in a good mindset and I think we’ve just got to switch to that. “It is a big game - individually and for the club - and it will be good to get into the next round. 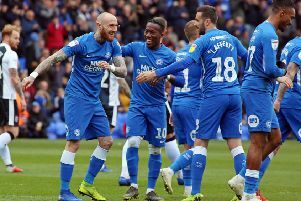 Posh have slipped to 10th in the League One table after Saturday’s defeat, but Hughes said the entire squad is convinced that the play-offs are a realistic goal this season. He added: “Everyone knows Blackburn are a good team, but on our day we can beat anyone. Our first-half display just goes to show that. We just needed to repeat it second-half. “Losing three goals was a blow, but we could have got something out of that. “We created some good chances, and to go in at half-time one-nil up was credit to us. “There’s not one player in the changing room that does not think we can’t get in the play-offs.